Pumpkin Spice Granola. Fall is here and it’s time for pumpkin recipes! 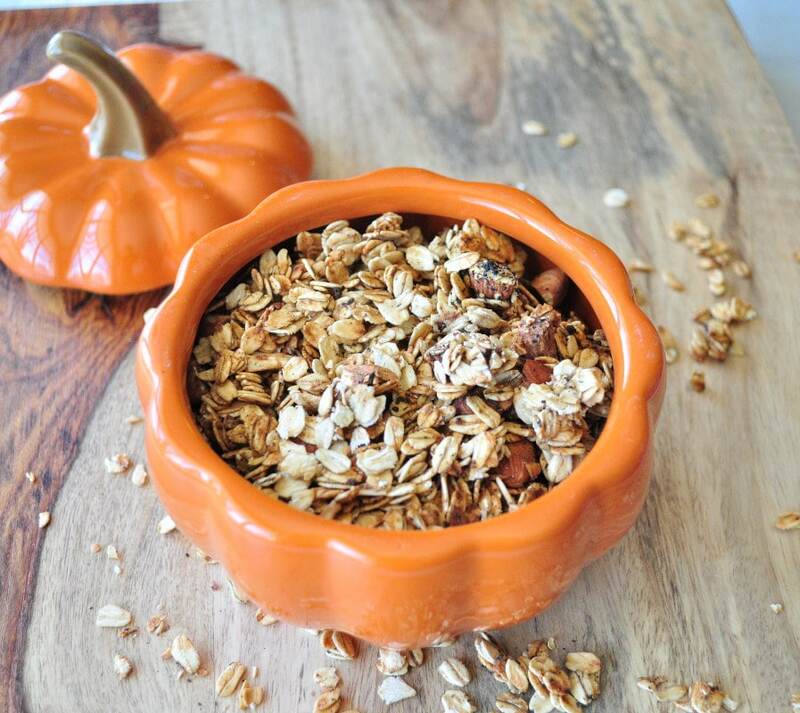 Perfect for this pumpkin spice vegan granola. I love pumpkin and eat myself sick of it every Fall. I also try to stock my freezer up with pumpkin in case I get a craving in the Spring. Most people like granola, but sadly, the store bought versions are laden with too much processed sugar. 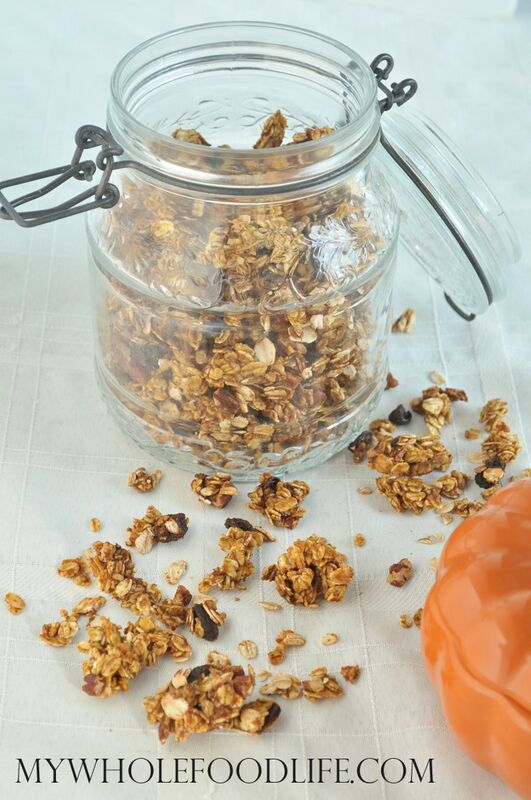 This Pumpkin Spice Granola recipe is made healthier. This granola recipe is vegan and gluten free. It can easily be made nut free if you omit the pecans. They are really an optional ingredient, but I do think they add nice flavor. Cranberries would be delicious in here as well. This will also make your house smell awesome as it cooks! If you are a visual person, I shot this quick video on how to make it. For more videos, you can subscribe to my You Tube Channel. In another smaller bowl, whisk the wet ingredients together. Now add wet to dry making sure to mix well. Spread mixture onto lined or greased baking pans. Pull out and shake the granola around a bit and put back in for another 18 minutes or until granola comes out crispy. You are welcome! Look forward to seeing more of your recipes! Looks awesome - can't wait to make it! I just have a quick question. Regarding the "1/2 pureed pumpkin", what measurement is intended? Is it 1/2 cup, 1/2 a can, or 1/2 of a "pie" pumpkin? ;-) Thanks for any clarification! Love your site! Thanks for the clarification! It just reminds me of the time my aunt used a can of pumpkin filling rather than a cup...and couldn't understand why her pumpkin bread wouldn't hold its shape. Anyhoo, can't wait to make this!! What kind of canned pumpkin do you use? Like Libby's Pure Pumpkin?? You can use Libbys. I used an organic canned pumpkin. I got it at Whole Foods, but Libby's would work too. What brand do you use? We don't have a Whole Foods or Trader Joes in my area. I see 1/2 cup here in your comment, but the recipe says 1 cup. I hope you see this comment and clarify, as I'm just about to make this! I don't see brown sugar in the recipe. What am I missing? I am absolutely loving all these granola posts! Deliciousness! What kind of applesauce do you use? This looks great and I'm going to make it today! Do you happen to have the nutritional information? Thanks. It's about 230 calories per 1/2 cup serving. I am assuming that the Cloves, Nutmeg, & Ginger is all ground, right? What type of salt do you use, Kosher or Sea? Thanks!!! I LOVE LOVE LOVE GRANOLA and was so happy to see such easy recipes!! Keep making more!!! Do you have a recipe for just "basic" granola? Made this last week and it tasted great (I also added some pepitas)...but it didn't get crunchy. I only cooked it for 22 minutes because it started to burn. Any thoughts? If it matters I baked it on two sheets and used parchment paper. I just made a batch. I cooked it on 300, stirred more frequently, and cooked for about 30 minutes total (last time was 22 on 330)...and it came out crunchier. Would cook longer but some started to burn. Maybe it is my stove! I could see lowering the temp a little more and cooking longer. Either way...tastes great and I doubt it will last very long! Lowering the temp may help. I think that is a good idea. This looks incredible, thak you!! I cant wait to make some! Thank you Michelle! I hope you enjoy it! I only have old fashioned oats. These should work right? Great recipe. Packaged cereal is my husband's weakness - he eats like 3-4 boxes a week. I have been trying to get him to try some breakfast alternatives that are not loaded with sugar and additives, but he doesn't seem to like anything. I made this and he liked it + he said it kept him feeling full all morning. I'm going to have to try some other granola recipes. If I wanted to add nuts, raisins, or seeds...do you suggest adding them after baking or while baking? I was thinking some pumpkin seeds and nuts would be a nice addition for some protein. Made this for the first time yesterday and it turned out great! I also added in some dry, uncooked quinoa and some hemp hearts to the mix. It is delicious! Thanks so much for the great recipe! I will definitely be making this again soon. LOVE your recipes, excited every time I get an email update!! Was curious if I can substitute some local honey in place of the maple syrup? Thank you! Thank you!! Yes you can. Hi! My daughter and I are hoping to make this over the weekend. Can you clarify the amount of pumpkin puree you use? The recipe calls for 1 cup but I see in the comments you said that it was a half cup. I'd love to know if you get a chance, Thank you!